The challenges faced by a college student, such as myself, are quite different from those faced by a whole household. I don’t have to think about home maintenance or paying the electricity bill. The most I have to worry about is vacuuming the carpet in my dorm room that always seems to be dirty. Many people would pass these differences off as the luxury of being a college student before being thrown into the real world, and in a sense it is. 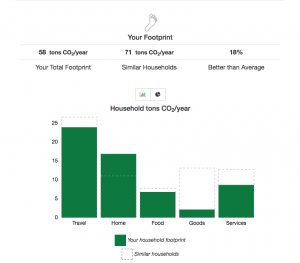 My family’s carbon footprint is about 5x larger than mine is as an individual living on campus. However, there are only 3 people currently in my family’s household, meaning that each individual takes on a larger portion of the footprint, each a whopping 19 tons of CO2 per year compared to my 12 tons. That is a lot even considering my family’s footprint is 18% better than the average household of a similar size. What accounts for such a large carbon footprint in the household? It comes back to that luxury of being a college student, and simple common sense. A larger living space ⇒ more energy needed for things such as electricity ⇒ bigger carbon footprint. This turned out to be one of the largest issues for my family’s footprint. The home section of the footprint calculation was 58% worse than average carbon emissions for a 3-person household. This was a little surprising for my mother who thought that the extra insulation, low energy windows, energy-rated appliances, and other features purposefully installed in the house made for an energy efficient home. However, the house was constructed 12 years ago, and it is really designed for a larger family, not the three people living in it currently. My mom stated that this was one of the most important things she learned from calculating her carbon footprint. Even if you make choices to be more sustainable, they must be done in the necessary scale to have the impact that you imagine them to have. My parents plan to look into other options to improve energy efficiency, and will be downsizing when they buy their next house. So considering the size of the house and the maintenance required for upkeep, it makes sense that my family’s household footprint is larger than mine here at college. But how much do the individuals in the household contribute to the footprint? More than you might think. 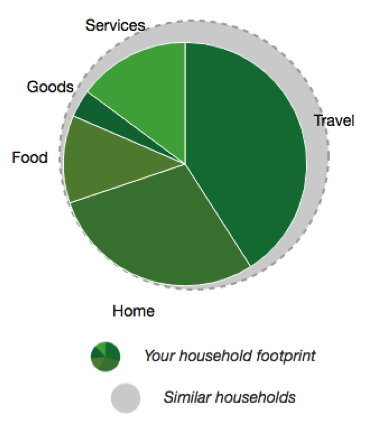 As I discussed in the analysis of my carbon footprint, food was one area where I had a lot of room to improve. My family had similar results except now there are three people making those same carbon-emitting choices. If even one of those people is able to reduce his individual carbon footprint from food, it would lower the footprint for the whole household, and that is exactly the challenge my brother set for himself. My parents set individual goals that will decrease overall footprint when accomplished. My dad plans to decrease the infamous vampire electronics (chargers that still use energy when not in use), and my mom will organize errand strategies to decrease overall driving time and mileage. Surprisingly, travel was one area my household was below average, where many other families tend to be high. Although we rack in a lot of miles flying, our drive time is unusually low, especially now that I am out of the house. It helps that my dad seeks out fuel-efficient vehicles when purchasing a car. While there is definitely room for improvement in all areas of carbon emissions, travel is one where my family is already making great steps towards reduction.